'Of Mothers and Memories' by jan-u-wine, with painting by Mary Cassatt. ~ detail from Cassatt's "Mother and Child"
I chose jan-u-wine's short poem Of Mothers and Memories to be the last of the four parent poems because it "feels" last, like a summation of Frodo's feelings about his mother that survived the War, survived his decline after his return to the Shire, perhaps until the end of his sojourn in Tol Eressëa. Reading his thoughts, the particular things he remembers makes me think of my own mother. What will I remember most? Similar things, no doubt - the sound of her voice, her touch, the body-words of love. My mother is not dead, but she is old and becoming frailer. I know the time for remembering is not far off. Perhaps that is why I have warmed to these poems about Frodo remembering his parents, just now, especially his mother. "Applicability", Tolkien might have said. The image I chose to complement this post is one by Mary Cassatt (1844-1926), an American artist who painted and showed her work with the Impressionists in France. She was a very determined person, or she might have been discouraged by the obstacles put in her way as a woman trying to make her way as a professional artist. Fortunately for us, she produced fine pieces for decades, many of which have been preserved. I love the feel of this pastel, intimate yet contemplative. Perhaps the child is fresh from a warm bath, still a bit damp and burrowing against the warmth of his mother in a cool room. Whatever the original circumstances, it captures for me a sense of Frodo's remembrance in this poem. 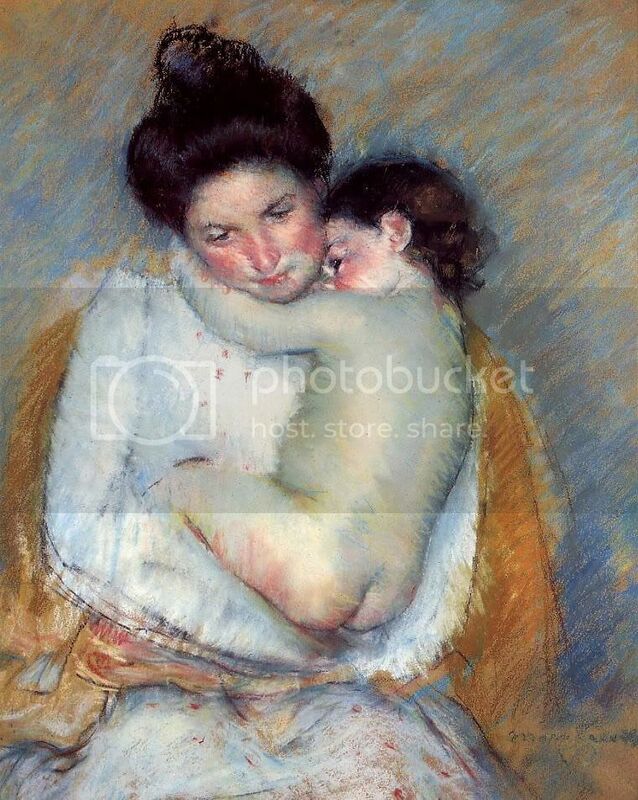 Mother and Child by Mary Cassatt, pastel drawing, c. 1900.
seeking the last of her. leaves turn in bright-paged books. A kiss lightens my brow. ~ jan-u-wine's "....they are but beggars....", plus Monet's "Pond at Montgeron", 10-19-10. Beautiful - both the poem and the painting. Oh. This was very touching, Jan.
"it "feels" last, like a summation of Frodo's feelings about his mother that survived the War, survived his decline after his return to the Shire, perhaps until the end of his sojourn in Tol Eressëa." I still have trouble remembering my mother. I miss her so much that it almost hurts to remember her. Not how I thought it would be. Primula, thanks for reading and commenting. Relationships with mothers are rarely all sunshine, but most are strongly felt. Most of us like to imagine Frodo and his mother had a beautiful relationship, a shadow cast only by her early, sudden death. When did your mother die, Primula? You say you are having trouble remembering her, although you miss her terribly. A seemingly odd combination, not remembering yet missing. I keep wondering if I will forget my mother in time, after she's gone, an idea I don't like. I already have difficulty remembering my dad, except for isolated "scenes" or some of the things he said, and he only died in 1993. Photographs and snips of old videos are what jog my memory best. Yet even though I have forgotten so much, I haven't forgotten that he's gone and that I'll never see him in this life again. Missing someone doesn't seem to be directly related to remembering all about them. She passed in 2007. When I say I have trouble remembering her, I guess I misworded that. I loved my mother a great deal, and she me. We were so close that when I do think of her, it's with fondness. But it's followed by a sadness that she's no longer here with me. My father died nearly 20 years ago, in 1991. I can hardly believe it's been so long. I had grief with his passing, but it was different than with my mom. I think it's because my dad had moved away from me long before he died, so maybe I was more used to his absence. My mother was always very close by, so her passing left a big hole in my life. I think as the years go by we do remember people less, but I still have times when I remember Dad, and those memories are sweet. I expect one day I'll fell the same about Mom. A number of my LotR friends have lost their mothers in the past decade. Many are still feeling the sorrow of it. At least one lost her mother during the course of the films, making the trilogy that much more affecting for them. I learn so much from you. You have an incredible knowledge of art and what you and Jan_u_win bring together is magic. There is always something that tears into my heart when I see an image so like Elijah's Frodo. This babe is him held close with a flush face of warm love for his mother, just as hers is for him. Her arms rub his legs and hold him close. The warmth resonates in certain areas of the body so you feel it in the nakedness of a baby's soft skin. I thought that, too, Verangel. The sub-section of your quote is a line that made my hair lift on the back of my head, he remembers her after all he's been through, "all the shadows I have known / and been known by". And been known by. Whoof. That's jan-u-wine. One two-part phrase, and she's suggested so much to the reader. It's a richness in spareness. I loved your description of the painting, noting the flush in the faces, the warmth that resonates. The tonal warmth and the quick, soft strokes of her pastels all speak of a warm, vibrant, living love to me. Gee, I love this picture! That's a lovely, very moving poem. My mother is not dead, but she is old and becoming frailer. I know the time for remembering is not far off. Yes, I am in the same place as you. My dad is in his 80's, and my mother begins to seem much more fragile to me. I cherish each day with them. Mews, thank you for the supportive words. I know when it comes to losing people you love, you have "been there, done that". As to the image, I was surprised to find that a number of people find her pictures sentimental. I don't. I think they're very well-observed, almost like the journal entries of an observant writer, but that happen to be executed as images rather than texts. To browse an extensive online gallery of hers means looking at a lot of women and children, but I don't see that the subject matter (women and/or children) equals "sentimental". I found the painting above moving, even apart from it making me think of Frodo and Primula, because the moment she is portraying is moving. She hasn't airbrushed it, made it simpy or trivialized it. She has simply recorded what was before her. The liveliness of her strokes and warmth of her colours in the rendering might be said to amplify the sense of deep feeling between the two, but I'd say it merely "brings it out", brings to the visual surface what Cassat could see and sense was there in the subjects before her. Thanks, Antane. I'm so pleased you liked the piece. Beautiful. The last part is heart-wrenching. Thanks, Addie, for stopping by. P.S. I love your Lorien icon. Did you make it? It really is exceptional. Heartbreaking in a healing way, I hope. Yes, for the most part, but when he calls her 'Mumma', it just reminded of how very young he was when he lost her. The icon is lovely, isn't it? I would like to be able to take credit for it, but I've no talent for that sort of thing. It's one of rakshi's creations. Go, Rakshi!!! I love the way she has enhanced the detailing of his eyes, his hair, and the outline of his chin and jaw, yet also enhanced the softness of the image, bringing out or adding luminous effects here and there. Gosh! That is a beautiful poem. Aw, thanks for stopping by, Estë. It's a beauty of a poem, yes. And by the way, that icon is unbelievably touching. Is it from a real photo of a very tiny baby or is it photoshopped, do you know? I'm up late, as you can see. It really is a touching photo. I found the picture on the net and added the text. You did good, you night owl, you. Now that you've posted a new icon I have to ask: it's based on film Frodo, so is this an illo for a fan fic, or a piece of stand-alone fan art? The artist goes by the name of Rocio. I found it on the net too. It was an illustrated Mary-Sue. I remember that the young heroine was sitting at her school-desk, daydreaming about Frodo, while her classmates were jibing her for being in love with Frodo. She was quite oblivious to her surroundings. The last strip in the sequence showed her gaping in awe at the new arrival. He looked exactly like Elijah Wood. Chuckle-chuckle. The other icon is also from the said comic strip. I have tried to find it again but it disappeared together with many sites dedicated to Frolijah. I have even searched on the Deviant Art site, although not recently.